I wanted to share as many images of macrame pieces as I can, because I know that when you love macrame you want to see a lot of knotted work to be inspired and to develop your knowledge meanwhile. And then came the idea of ‘You made it gallery! :)’. What would be greater inspiration to macrame lovers than to see how other knotters make the projects published here. 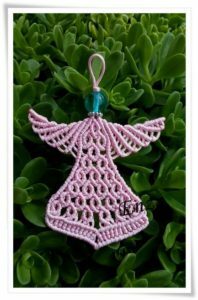 You can see how Enza made her lovely Angel and how Renata transformed an earring pattern to cute bracelets. This feels good to see how you complete the patterns and how you think further, transform and remodel them. Fantasy is infinite. 🙂 I believe in that two people who never saw each others work before, can make almost the same products with knotting technique, because there are many basic steps, which eventuate almost the same texture. Of course, in an advanced level, there is style. I publish simple pieces to stimulate the creator in yourself to understand the nature of knotting, to be brave to spend time on differ from patterns and discover your unique style.